Crete - An island in the Mediterranean Sea south of Greece. Formerly Crete was a province of Turkey. after an extended period of civil wars, France, Great Britain, Italy and Russia intervened and declaring Crete an autonomy, place it under the administration of Prince George of Greece as high Commissioner. In October 1908, the Cretan Assembly voted for union with Greece and in 1913 the union was formally effected. Anyone else would like to share? 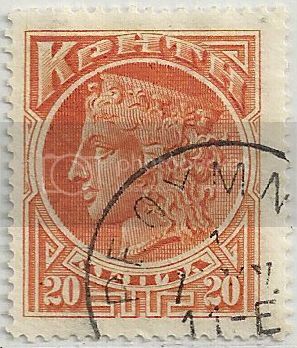 Issued in 1901, features a profile of Hera (the Greek queen of the gods). Although I can't read the date, it was postmarked in Rethymno, which was actually controlled by Russian military forces at the time. 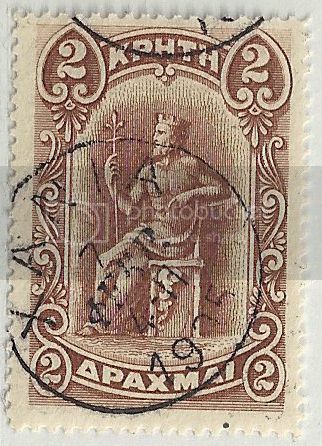 Issued in 1901, features the figure of Minos (a mythological king of Crete, who was the son of Zeus and Europa). 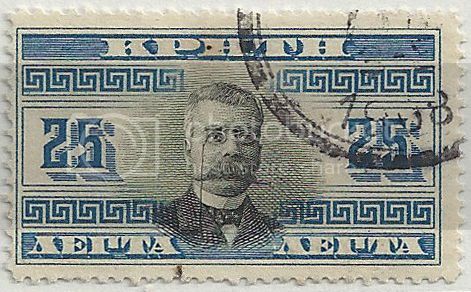 Postmarked Feb 7, 1905 in Chania, which was the capital of Crete and was controlled by Italian forces. 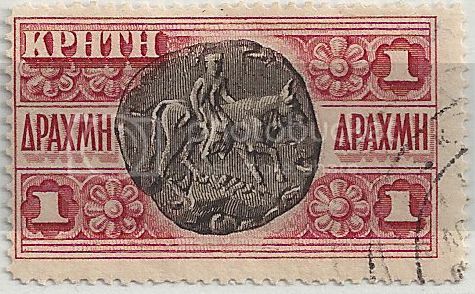 Issued on Feb 15, 1905, features Zeus as a Bull abducting Europa, from an ancient Cortyna coin. 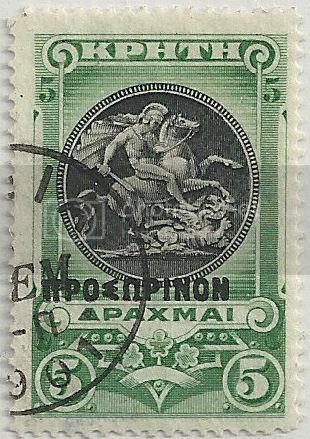 Issued March 1, 1900, features St George and the Dragon. The black overprint "ΠΡΟΣΩΡΙΝΟΝ", means PROVISIONAL. Issued August 28, 1907, commemorating the Administration of Crete under a High Commissioner. The stamp depicts Alexandros Zaimis, the new High Commissioner, appointed after the resignation of Prince George. All of these stamps so far were issued by the "autonomous" government in Crete, however the island was occupied and order was kept by the military forces from the "Great Powers" (Britain, France, Italy and Russia) who took control in 1897 during the Greco-Turkish war. Crete was divided into four quadrants, each controlled by one of the Great Powers. 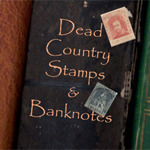 You can see a map of the quadrants and read a little more of the history HERE, at DCStamps. Each of these occupying forces also issued stamps as well. If anyone is interested, I will show some of these later.